It’s early February and although it is still winter in Southwestern Montana today felt just a little more like spring than usual. The last week here in Ennis, Montana has been about normal for winter temperatures. So when we get a day around the 40 degree mark there’s one thing that comes to mind for me. Ok, honestly, more than one thing comes to mind but I’m here to focus on the one that is always just one or two degrees away from being the only thing that comes to the mind for me and that’s fishing. This time of year specifically fishing and catching a trout on a midge dry fly. Midges hatch most all winter but February is about the time I start to jones for a trout on a dry fly. 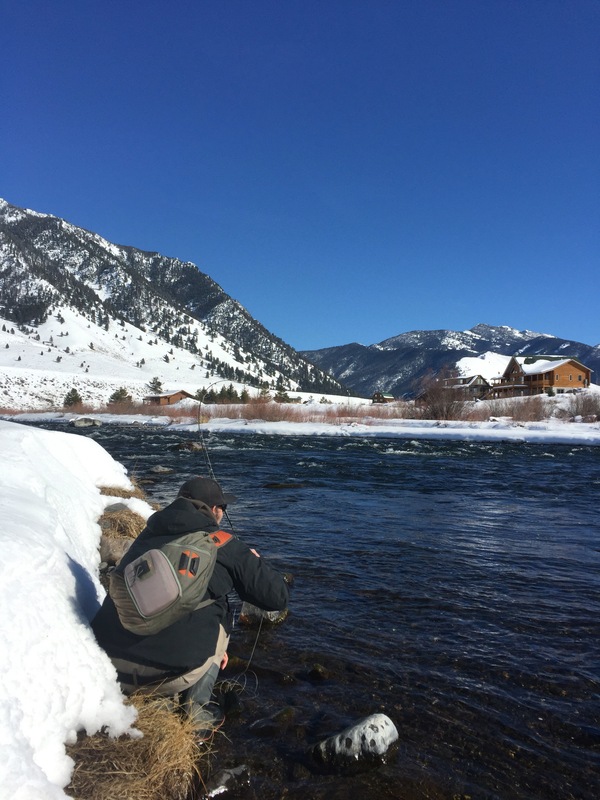 Right about the time this feeling starts there is a wonderful and sometimes predictable occurrence on the Madison River and that is the winter midge fishing. Funny how that happens. One might even be inclined to ask what comes first. The jones or the midge. I’m going to say the midge though because those little bugs are out all winter just trying not to be eatin by a hungry trout. By this time I’ve spent enough time at the vise and in front of a computer to really bring that little dry fly jones right up to the surface. So what’s a person supposed to do when they start feeling this way? I believe the answer is to go catch a fish on a dry fly of course. Knowing we might get some good weather a good friend and outfitter Matt Carey and I set a small but significantly gratifying plan in motion. That plan was to head to an iconic bridge on Madison River and catch a fish on a dry fly. Matt helps motivate me when otherwise I might just be a “vise potato”. What’s a “vise potato” you ask? Someone who spends way to much time inside tying flies in the winter. I would like to say thanks for getting me out to get a “fix” for that dry fly jones. All in all the fishing was ok for a couple of hours. With patience we saw several fish eat dries and several that were willing to eat our dry flies. I think I only went one for three and blew a shot at my biggest fish of the day. But that’s ok, it has been some time since I last dry fly fished and one fish with a few extra chances was fine by me. After 20 years I don’t always need the most or the biggest to get my fishing “fix” for a day in February. A size 18 or 20 single black midge works well when they are not clustered and the classic Griffiths Gnat still takes plenty of fish when the midges are clustered. We also had several fish eat nymphs for us and I think that is the way to go if you want a few more fish. A small stonefly with a midge trailer is all that is needed for that. I find most fish will eat the stone nymph given the chance as they are happy to eat a larger meal this time of year. Some days they will get picky and then it’s time to start rotating through the small patterns. 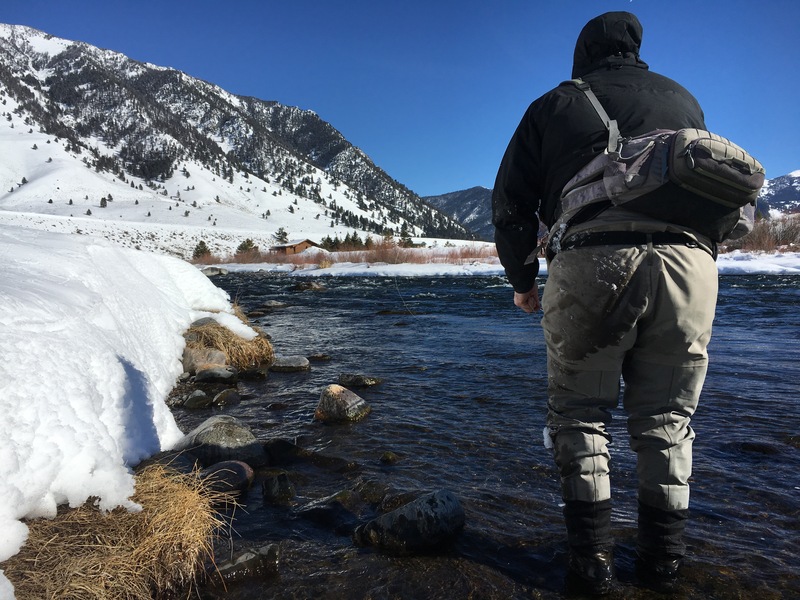 Water levels are about normal for this time of year and that makes for good access to wading anglers. I’m also looking forward to putting the boat in the water soon. We have some regulation changes and license fee increases going into effect at the end of the month and I will cover those that are important to us here in the Madison River. Stay tuned for that. Also if you like this and want a little more head over to www.montanafishman.com to sign up for the newsletter and also check us out on Facebook and Instagram for news, weekly fly giveaways, fly patterns and more. Thank you checking in and I hope to see on the water.